Looking for waterproof trousers? Check out our Buyers Guide! A heavy downpouur brings all regular trousers to their limit. Don't just keep your upper body dry. Choose proper waterproof trousers for rough weather conditions. The term ‘hardshell' doesn't only refer to jackets but also to permanently waterproof trousers. The following points are to help you choose the right waterproof trousers. Classic overtrousers are probably the most common type of waterproof trousers. If you only need weather protection, you can simply wear them on top of your regular trousers or shorts. Overtrousers are light and have small packed dimensions, which allows you to take them with you anytime (stuff sacks often included). In terms of breathability, any waterproof material is inferior to materials that are windproof only. Therefore in order to maintain a comfortable body climate, you should only wear overtrousers when it rains or as protection against extreme abrasion (mountaineering). For activities during winter or in the high mountains, lined waterproof trousers are a good alternative. They combine hardshell outer material and a light thermal lining in one piece of clothing. This makes constantly taking off and putting on clothes and additional insulating layers problem's of the past. A disadvantage of waterproof trousers is their reduced adaptability. Cheaper models of waterproof trousers are usually made of a two-layered, manufacturer's own material. The seams are taped and the material is permanently waterproof. Special coatings keep the fabric from sticking to your skin. Most waterproof trousers are cut relatively wide, which makes them easy to put on. You could consider a three-layer model if you're planning trips under extreme conditions that require high degrees of wear resistance. Some models come with a full length zip down the entire length of the leg which is a convenient feature. It also makes it easier to put your boots on and provides you with added ventilation. If you're looking for waterproof trousers for cycling, you should make sure they have (three-layer) reinforcements in the seat area and width adjustment for the lower legs. Integrated braces keep cycling rain pants from slipping and exposing your skin to the cold. These are recommended for hardshell models for alpine or high mountain adventures. 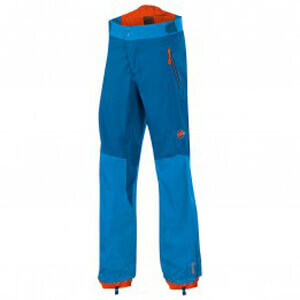 Hardshell pants designed for winter use are generously lined and come with an integrated ankle snow gaiter. If you value sustainability, you will also find good rain pants made of recycled polyester (i.e. Fjällräven Eco Shell)!